Some workshoping in economy for artists are due! At latest since 2008 it became clear, that the economic system we are living in and with is wacky, unjust and not sustainable. Many of its instruments are either exaggerated, or exhausted. The bubbles it produces in different markets are getting out of control, and deregulated fiscal constructions are dramatically failing. Yet, business is going on as usual – but beside, main social pillars are being washed away. The current economic crisis is not only a result of some major failures in speculating practices, it is the outbreak of the constant crisis inherent to the system. Since many years a precarious and dangerous economic climate has been created through the exploitation of the society and the environment in the believe in constant growth and a policy relying on the infinite creation of money for some through the creation of infinite debt for the majority. The current cuts of public funding and the absence of interesting jobs are just some visible signs of the consequences of governmental reaction towards the 2008 crisis. Arts all over europe are now more concretely targeted for cuts then ever in the last 40 years. In this climate artist are forced to rethink our relationship to the economics – a situation to be cached! We have to leave our triple position as critiques, prototypes and profiteers of the system, and rethink our relation to the protection through governmental funding. This can not be done by making art in a more ‘economic’ way. This workshop rather launches a discussion about the repositioning of the economic field towards the arts. We have to occupy and appropriate the “economics” and its terminology and fill it with new practices and new meaning. We have to occupy the vocabularies, the practices and the appearance of the economy and to open it to a wider spectrum of life than just a financial success. For that we have to ask, what do we expect from future live? What is it what we really are ‘dealing’, ‘trading’ with? What is our currency? What is/was our real contribution to the crisis and how do we fictionalise the changes to come? What kind of traps are we constantly taping as artists? What kind of an economy could we establish out of an artistic (researching) practice which will make a real difference? Thinking economy over! Rethinking economy, or thinking economy is over! These questions can be attacked by analysing the different notions of ‘performance’ in economy and in the arts. The understanding of “performance” differs in general in their aims, aesthetics and actions in both fields. Performance on stage has to do with appearance, or transformation, performance on ‘stock’ with accomplishment, growth and power (thrust). A mixup of this different understandings happens in a very complex way, when it comes to the commodification and dissemination of knowledge – and even more when this happens through artistic practices. We would like to propose a two week workshop in two parts. 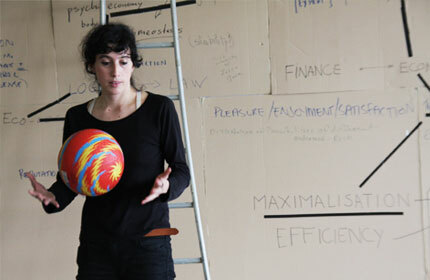 The first week should concentrate on performing the reality of the economic crisis and the crisis of art-making in relation to financial policies. By inviting theorist and artist Georgios Papadopoulos, (“Notes towards a Critique of Money”) we would undertake an extended analyse of the relation between art and currency. What is our currency? What is the promise behind this currency? But also what are we actually dealing with by dealing with currencies? hile in the second week we would like to go more into alternative economic systems. For that we will collaborate with the behavioural economist Marieke Huysentruyt and will appropriate and translate economic ideas such as the ‘Gemeinwohlökonomie’ and Parecon. How are alternatives possible? How can art-making develop economic alternatives? How can the economy of art-making be reclaimed and recoined with other meanings and values? The workshops are based on a similar lab structure. In order to compare and relate the differing understandings of ‘performance’ in a practical an discursive way, we will setup a lab where artistic performances and economic performances should coexist, contradict and corrupt each other. The lab is a simple square furnished with some material and positions for artistic and economic activities. It will be constantly filmed form the sealing above. This should allow to understand the procedures on the square as scores or choreographies – the choreographies of relinking and rethinking art and economy. In other words – the workshop is a lab for the performance of the reality of art making. Ocean#10: 1st Gathering from Nicolas Galeazzi on Vimeo. The Adoption Project takes on the bonds and habits between you and your artistic practice. It challenges the perspectives and positions you engage with in your artistic process and takes them away from your personal involvement by handing them over to a different look, practice, or routine for a certain period of time. A clear defined section of your project shall be packed in a 'box' and given up for adoption, while you will take a section of someone else's research temporally under your 'protection'.